From the Calamity Quilter somewhere close to a seam ripper in Red Lodge, Montana. I picked up this quilt kit from the Seeley Lake quilt store, sorry, I can't remember it's name for sure. I've had the top done for months now so getting this one on the rack of the longarm felt pretty good. I had a lot of fun just goofing around with the various blocks and designs and just letting the APQS find it's own way. I am also doing a wall hanging that has a few pumpkins in the display, guess it's the season, just wish a few more would have grown in my garden this year. 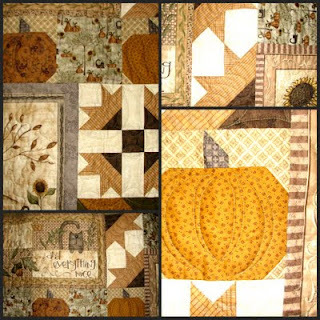 Lots of different blocks in this one, should look great up on my wall for this fall! Take care, and happy quilting. I'm a pretty traditional quilter, but I'm trying to branch out, explore more fun colors and styles. This is the very first quilt I did on my new APQS Millennium Longarm Quilting Machine, and I think it turned out pretty darn good. The little guy helping me with the picture is my grandson David, he just has to be in grandma's sewing room. I had not been a stranger to finishing quilts on a big frame with a machine, but I feel like I came from the dark ages and just got "back to the future" on this really fun machine. So far I'm trying my hand at all freehand designs, or specific stencils for certain blocks. I can do the pantographs, but I think when someone puts so much effort into a quilt, it needs to have a design that kinda goes with the theme of the quilt too. I don't want to give my exact age, but any middle aged (or older) quilters will know what I mean about quilting with pieced polyester fabrics. Oh my, they were cheap, they were wide, they were colorful and plentiful. I made pants out of polyester, and I think most of the jackets and men's suits were made of the stuff as well. You couldn't hurt this stuff, the only bad thing about making a quilt out of polyester, is that I used cotton thread, and the cotton thread gave up way before the fabric. My sister just informed me that she wants me to "fix" the polyester quilt I made her years ago. She loves this quilt, it's been through everything with her, through thick and thin. She even had her husband use it out on the highway as a barrier to the gravel and ice muck on the ground as he crawled under their pickup to fix some mechanical thing. I would really rather make her a new one, the idea of fixing this thing just doesn't sound like much fun to me. Maybe she can just keep the old one in her car "for emergencies". My quilting passion has continued over the years, waxing and waning and at times on the very back burner. But lately, over the last 5 years or so, I decided I needed to explore all the wonderful new fabrics and get to piecing. 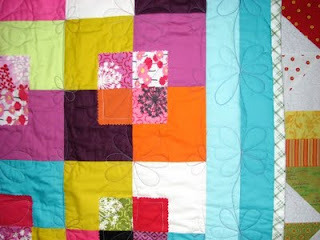 Now, I think I'm a crazy quilter. Those of you who have this affliction can relate. I had so many quilts stacked up I decided to buy a longarm quilting machine, top of the line! Since I got this "toy" and set it up in my "toy box" quilt room, I've been smiling, a lot! I have known that I wanted to do this longarm adventure for awhile, but I was really apprehensive about the way things would turn out. 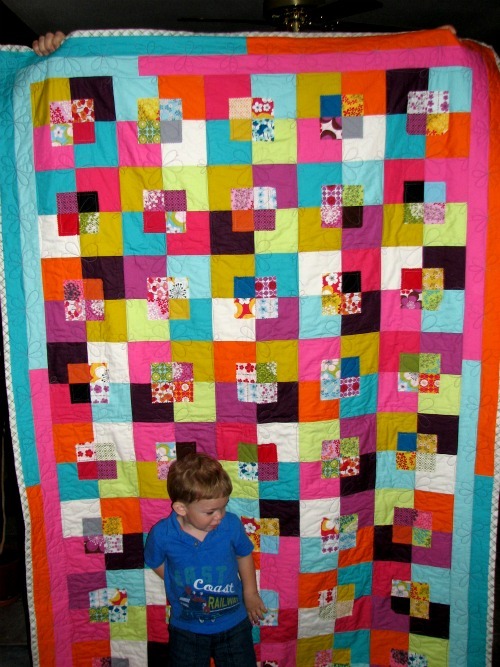 Could I make a quilt really look good? Could I let my creative juices flow without making a mess? Oh Ya! I've been on for a couple months now, and it's so much fun I can hardly contain myself. I only have 6 more of my own quilts left to do (or should I always have more tops to do?). I've decided I'm ready to "hire out", and some of my quilting friends are pretty happy about that. I haven't tried the whole edge to edge pantograph thing yet, even though I have them. I've been getting carried away with feathers, swirls, flowers and a few stencils. My free hand stuff is actually the best. Since I've been practicing, I've developed some of those "quilter movements" that I've watched on other longarm quilter videos (might need to make my own videos). I've also decided that I should rent out my machine on occasion as well. I know that when I got my hands on the controls, I wanted to get going on my own quilts, and I know other crazy quilters are of the same mindset. So here we go, I'll be posting updates and pictures so you can see what's happening with the quilt tops people bring me to quilt. If I can help you, just email me at 2wandathomas@gmail.com and I'll see what kind of project you have. Quilters are my people. I love to share what's going on in my quilt shop in the little mountain town of Red Lodge.